A Florida jury is hearing testimony in the trial of the last three former Florida A&M University band members charged in the hazing death of Robert Champion. The defendants—Benjamin McNamee, 24; Aaron Golson, 22; and Darryl Cearnel, 28—are being tried together, the Orlando Sentinel reports. 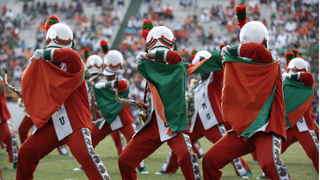 Fifteen former members of the famed FAMU marching band were charged in Champion’s beating death in November 2011. The three defendants on trial are charged with manslaughter and felony hazing. If convicted, each of them faces up to 15 years in prison. Champion died of hemorrhagic shock from more than 100 blows in a hazing ritual known as “crossing Bus C.” He had to pass from the front to the back of the bus while band members pummeled him with fists, mallets and drumsticks. On Wednesday Harold Finley, a former band member, told the jury, “It’s the same thing as being in a national fraternity,” the Sentinel reports. The day before, another ex-band member, April Tarpley, noted that she endured the hazing for respect. She recalled seeing Champion taking his beating. “It was just chaos. It was hard to really see or make out what people had in their hands or what was actually going on, but you heard the contact with [Champion],” she said, according to the Sentinel. A jury convicted the accused ringleader, Dante Martin, who received a six-year prison sentence last January. So far he is the only ex-band member of the 15 charged in this case to get a prison sentence. The others were given community service or probation or had their charges dismissed.